There is a phenomenon at Wimbledon that we might call Federer Face: that collective glow spread across the chops of spectators as they leave the show courts having finally seen the 17-time Grand Slam champion in the smooth-moving flesh. It's a tiny claim on his greatness, the pleasure in being somehow part of his sporting story; a tale to tell the grandkids, the sharing in a communal homage to probably the greatest there has ever been. With all Federer has done at Wimbledon, and the style with which he has done it, you can understand the reaction. What makes less logical sense is that the same does not happen to Serena Williams. There is admiration, of course, and great respect for what she has achieved. But even after her 25th Grand Slam final, there does not seem to be the same desperation to have seen her powers in person. And that, by any reckoning, needs to be put right. For Serena, arguably, is the most dominant single athlete in sport over the past 15 years. 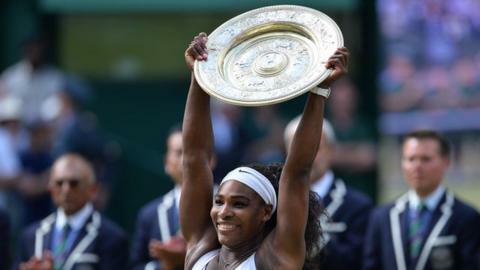 On Saturday she beat Spain's Garbine Muguruza to win Wimbledon for the sixth time and complete the 'Serena Slam' of holding all four major titles. In reaching 28 Grand Slam semi-finals she has lost just three. Of those 25 Slam finals, she has won five times as many as she has lost. She is the oldest player, male or female, to ever be world number one; 16 years on from her first Slam triumph, aged just 17, she has won the first three of the year with her 34th birthday just eight weeks away. To put that into context, there were 12 years between Martina Navratilova's first Grand Slam win and her last. It was the same for Steffi Graf. Margaret Court stretched her peak out to 13, yet she never won another beyond 31 years old. Federer? He won his first Grand Slam event in 2003 and his last, thus far, in 2012 - a span six years shorter than Serena's. Born within a month of each other, in the last four-and-a-half years, Federer has won one Slam, Serena nine. That Maria Sharapova has earned more money than Williams despite having been beaten 18 times in their 20 meetings is a sorry reflection both on the calculation of a sportswoman's commercial worth and our own appreciation of what makes a true champion. "Serena has shown that you can be tough, you can be fearless, you can be courageous, you can be a competitor and you can still be a woman," says former world number one and three-time Grand Slam champion Lindsay Davenport, who spent much of her career battling Williams. "She was the most intimidating opponent I ever faced. With some players you would be intimidated by their record or their game, like with Steffi Graf. But with Serena you were scared by absolutely everything - her passion, her attitude, how she serves, the power she has, her athleticism. "She plays tennis at a different level. She is better than any player on tour even if she is only at 80% - and I think she would still win a ton of matches at just 50%." There is the physical strength of Williams to admire: a serve not only of unprecedented speed but flawless technique, impervious to pressure or occasion. There are groundstrokes whose power gets all the headlines but with a depth and placement that is equally destructive. Then there is the immense mental fortitude: the three Grand Slam singles titles won after being match point down; coming through the depression and loss of form in 2006 that saw her slip to 95 in the world, coming back from the pulmonary embolism in 2010 that could have ended her career. Martina Hingis is only a year older and yet is reduced to playing occasional doubles, her body wrecked by injury and her love of the game sapped long ago. Justine Henin, a year younger, retired for the second time in 2011. Kim Clijsters, younger again, retired three years ago. To keep going as Serena has is one miracle. To keep going at the very top is quite another. "In the middle part of her career, when she went through a real lull, there was a lot for her to overcome," says Davenport, who was beaten by Serena in the final of the 2005 Australian Open. "Somewhere along the line she was able to flip the switch and get more into how good she actually is. She started to buy into it, but it came at a much later age than it did for some of the other previous champions we've seen. "During that period when she had eight to 14 Grand Slams she was in no-man's land. I know that sounds ridiculous, but she needed goals and the motivation to break records. "In a weird way it helped too having Federer around, who is still so committed and was still winning Slams and not going anywhere. All of a sudden it became OK to want to compete in your 30s and be able to dominate." Federer inspires devotion like few other players. It is impossible to imagine him behaving as Serena did in losing the US Open final in 2009 on a foot-fault and penalty point, telling a line judge that she would shove a ball in a place where it is not ordinarily found. Federer is all control, at least until the point of victory, when ice breaks and the tears flow. Serena is at least three contradictory characters in one - the warrior player, the handbag-designing girlie girl, the insecure body-conscious woman. She even has names for them: Summer, who is all smiles and thank-you notes; Psycho Serena, the on-court competitor, and then Taquanda, the US Open one, the one you really wouldn't want to be around, tennis ball to hand or not. Pretentious? Hard to warm to? This is a woman so lacking confidence that she refuses to lift weights because she is worried about making her arms look too big (she uses resistance bands instead), who grew up in the shadow of a more successful elder sister and then had to learn to beat her, who grew up in an area where no-one had ever gone where she was aiming. "I was never the one that was supposed to be good," she has said of her relationship with Venus, "but I was determined not to be a statistic." It is the complexity of Serena's character, the thing that seems to put distance between her and some fans, that should instead underscore her achievements. So perfectionist is she about her tennis that she refuses to play a game in practice in case she loses, and instead insists on playing a succession of unrelated points. "It's hard and lonely at the top," she has said. "Everyone wants to beat you. Everyone talks behind your back. God forbid I lose. It's like, 'Why?' Well, I am human." There are any number of reasons she could have escaped all that. She has won enough, earned enough, proved herself superior to Venus and all those other great rivals who have come and now gone. And yet she keeps going, keeps winning, keeps driving. "It's remarkable what she has been able to achieve in the last three to four years," says Davenport, at Wimbledon as an analyst for BBC Sport. "You have to give a lot of credit to her coach Patrick Mouratoglou. She was exclusively coached by her parents for so long and wasn't sure that she would ever respect or understand another person's voice, but she let somebody else in and he has got through to her. "Who knows why? Who knows how? Nobody knows the intricacies of their relationship, but he has got her to believe in herself and to buy into the mantra of, 'You are the greatest player, but you've got to still prove it'. "Their record is amazing. You can't deny that he has got her to completely invest herself emotionally in just about every tournament she enters. He channels her in the right direction." That dominance. Take it outside tennis, and who can match her? Tiger Woods won his first major in 1997 and his last in 2008. Cristiano Ronaldo was a 14-year-old kid in Madeira when Serena began her reign, Leo Messi a frail 12-year-old boy. Kobe Bryant has five NBA rings, but perhaps only Floyd Mayweather, 48 fights unbeaten since his professional debut in 1996, can truly compare. And that is against underdogs and outsiders as well as true contenders. To remain the best, Serena has had to repeatedly beat the best. No easy match-ups, no easy years, no easy titles. Tough. Fearless. Courageous. A competitor, and still a woman. That is Serena, and that is why we should celebrate her, even as she appears unstoppable, even as she appears forever.